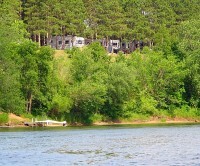 A seasonal site at Two Rivers provides you and your family the perfect recreational getaway. Our terrific seasonal sites give you the freedom to leave your RV on site all summer - NO towing, NO reservations, NO setting up and taking down, NO packing and un-packing. The season runs May 1 - October 1.